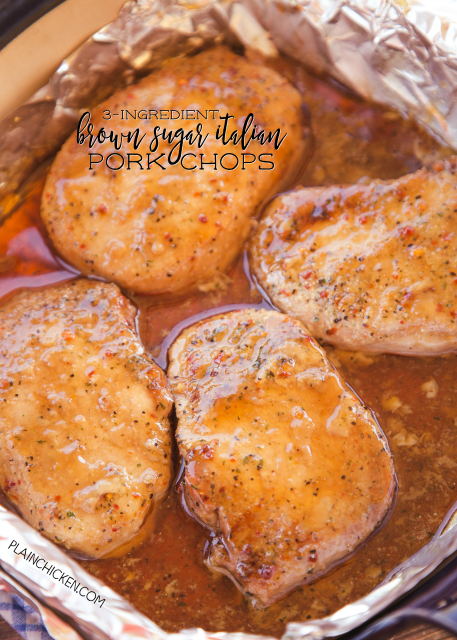 3-Ingredient Brown Sugar Italian Pork Chops - seriously THE BEST pork chops EVER! Only 3 ingredients and ready in under 30 minutes!! Pork chops, brown sugar, Italian dressing mix. There are never any leftovers. We make these at least once a month. SO good! 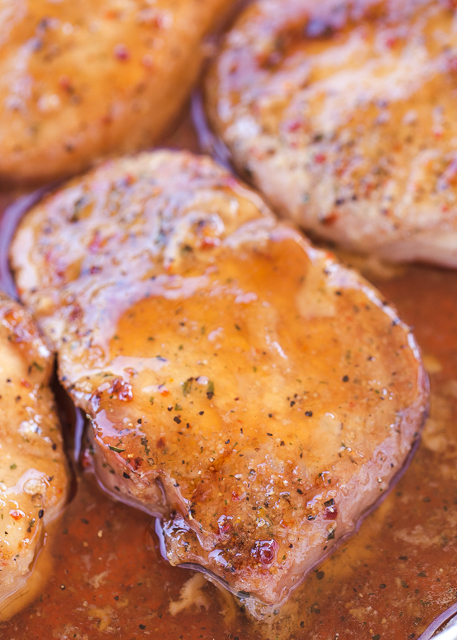 These 3-Ingredient Brown Sugar Italian Pork Chops are our new "go-to" recipe for pork chops. We've made them several times over the past month and love them every time. I do suggest lining your pan with aluminum foil. The brown sugar mixture gets sticky while cooking. The foil makes cleanup a breeze! Serve the pork chops with some green beans and scalloped potatoes for a quick weeknight meal! Turn broiler on HIGH. Broil pork chops until brown sugar caramelizes, about 1 to 2 minutes. Watch it carefully so it doesn't burn! Your picture looks like there is so much liquid. Do you make the Italian dressing first? Do u add water to the brown sugar and Italian dressing mix or no ? Do you think I could grill the chops after marinating? I don't know. I've only made them this way. Those look really good! I like that they're easy to make. It's amazing how much liquid there ends up being. I made this for dinner tonight and it was wonderful! My husband said it would be ok to make it tomorrow night too! It is definitely a keeper. Thanks for sharing. That is WONDERFUL!!! So glad it was a hit!! I made this for an early Valentine's dinner for my guys, and it was a big hit! This includes my husband and two young adult sons that still live at home. They loved it! Can't wait for my middle son, stationed in Korea (Army) to come home so that I can make it for him too! He'll love it! Served it up with bacon wrapped mac and cheese, and green beans. Yum! Thanks for all the yummy recipes! Love everything I've tried so far! This was a great recipe! My whole family loved it and we recommended it to a friend who loved it as well! So easy and delicious! Thanks so much for posting it! Thank you for this! I have a picky family of four (2 small kids) and no matter what I try I cannot find a single meal that all four of us like. Nothing. But this was it! 3 years of trying and tonight EVERYONE ate dinner and NO ONE cried!! I will be making this again and again. Would I be able to make this in my Crockpot? If so, would you suggest 6-7hrs on low? Thank you. I have made this recipe several times. It is definitely a keeper!! Thank you for sharing! Do you salt & pepper the chops first, or is there enough salt in the Italian dressing seasoning? I did not salt & pepper the pork chops first. I thought there was plenty in the dressing mix. I only have a packet of ranch -- any idea if that would taste ok? Only one way to find out! Give it a try. I love Ranch. Don't see how it could taste bad. This recipe was fantastic!!! So easy and delicious! Thanks for sharing!!! do you actual make the itlian dressing mix? Are they thick or thin pork chops ? These were the best pork chops ever, thanks for sharing it!! If I don't have a broiler, what is my other option? Any tips for getting the mixtut to stick better to the pork chops? If I’m only making four pork chops (only two of us here) what would be the preferred measurements for the brown sugar Italian dressing mix recipie?